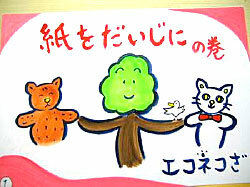 We have been doing the puppet & picturecard show, 'Eco-Neko Za' since 2001, with the aim of encouraging children in learning the environmental issues and practicing their activities with a lot of fun. As the puppets we use are not big, around 30cms in height, the show is is intended for an audience of 10 - 20 per performance. It doesn't matter whether it is a Western-style room or a Japanese-style room, if that room has a table that the puppets are put on to perform. 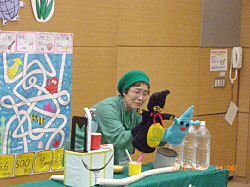 We also have a recycling handicraft class after the performance, matching the topics of shows. We go and perform in Kansai-area, mainly in Kyoto. As for the details, please contact us. 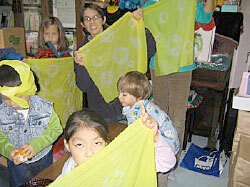 Eco-calendar that is suitable for homes and schools as an environmental education aid. Each year 5-6,000 copies are printed and distributed, some carrying the name and details of other envronmental NGOs. ECO-Calendar Past and Present Now available!